Let us guess — your neighbor’s brother said that his foundation repair cost an arm and a leg, and now you’re turned off to the idea of foundation repair. After all, how bad can it be? 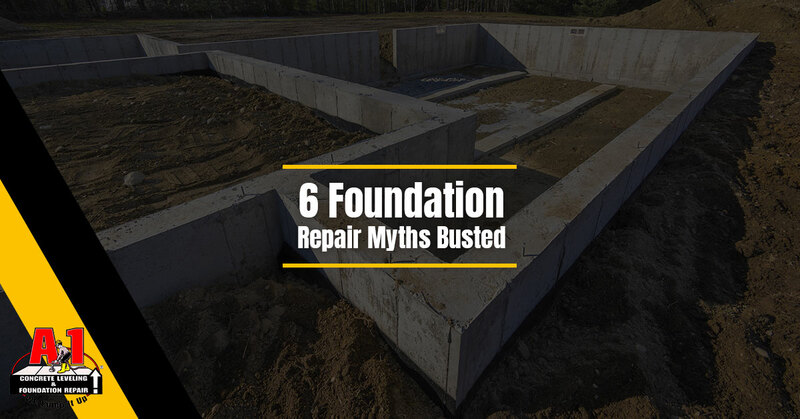 The idea that foundation repair is too expensive to take on is just one of many myths out there about foundation and concrete repair. In today’s blog, we’re going to try and dispel six of these myths. 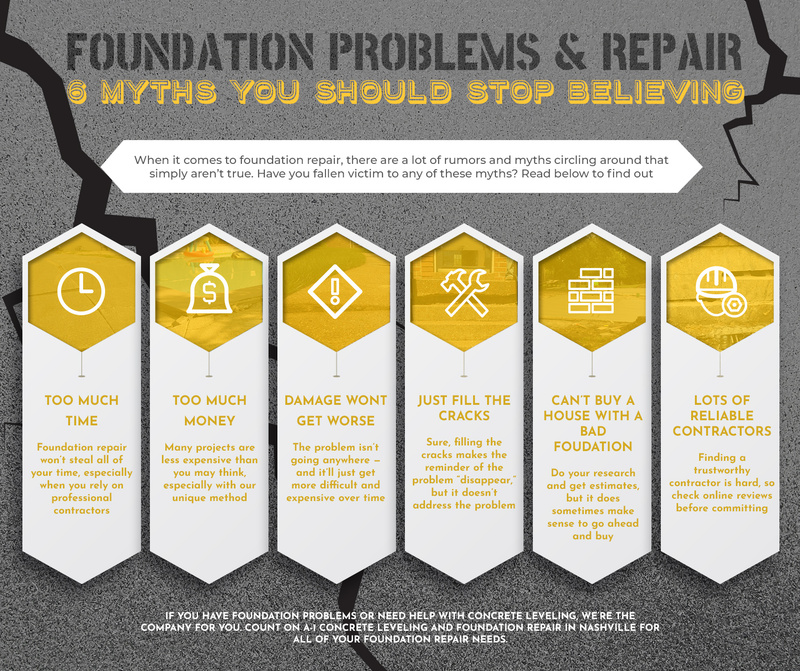 If you’ve been noticing foundation problems around your home, then we hope that these facts will present you with the information you need to be able to give our foundation repair company a call. Here at A-1 Concrete Leveling and Foundation Repair, we offer our services to clients throughout Nashville and the surrounding areas. Instead of desperately searching “how to repair cracks in concrete,” rely on professionals like us. Get a free quote for your foundation repair project today. Sure, your foundation repair may not be completed in an hour on a casual afternoon. But that doesn’t mean it has to take weeks on end — especially not when you work with professional foundation contractors. By working with a professional, reliable foundation repair company, you’ll have a solid estimate of just how long the repair will take. Many projects will, in fact, be completed in a day. Some will, understandably, take more time — but never so much time that it’s not worth the foundation repair in the first place. Sometimes foundation repair is relatively inexpensive and fast, just as it can cost more and take longer. With A-1 Concrete Leveling and Foundation Repair, we have a revolutionary technique that doesn’t require removing and hauling out old concrete just to pour new concrete. We’ll keep the cost as low as possible for you — all of which you’ll know from the beginning with your quote. Is it ever a good idea to procrastinate? It’s not a trick question. Delaying your foundation repair will only exacerbate the problem and lead to more expensive, difficult foundation repair down the road. Check out reasons to not delay foundation repair to get a better idea of how bad it can be to procrastinate repairs. Simply filling in the cracks with epoxy doesn’t actually get to the root of the problem, which could lead to more and more foundation cracks later on. It’s like a bandaid on the situation — it’ll heal and look better on the surface, but there are potentially underlying issues to address still. Clearly you don’t want to buy a house with foundation damage without first getting estimates and knowing what you’re getting into, but it’s still OK to buy a house with a bad foundation. Just do your research first. There are more scammers out there than we would like to believe, so it’s vital that you find a reliable, trustworthy foundation contractor who will charge you appropriately and do solid work. Learn what to look for in a foundation contractor, and be sure to always check testimonials. Did you learn something new? Whether you have questions about foundation problems, an aspect of foundation repair that you don’t understand, or want a free quote, contact us today. A-1 Concrete Leveling and Foundation Repair in Nashville is here for all of your foundation and concrete needs.